Celtic boss Ronny Deila says Sunday's League Cup semi-final with Rangers is the biggest game of his life as he targets a domestic treble. "It's a first meeting with Rangers for me," he told BBC Scotland. "It's exciting. It's going to be loud and it's going to be a very good day. "There is a lot of emotion. It means a lot to people, the whole city. Football needs derbies like that. "A lot goes into the game, it's not just going to the final. " Deila, 39, has been in charge at Celtic for eight months and the Premiership leaders remain in the League Cup, Scottish Cup and Europa League. He won the league and cup as manager of Stromsgodset in his native Norway and was also a cup winner as a player with Odd Grenland. "I've played in big games and finals before but this is going to be a very big one," he said. "You can feel the atmosphere in the city. Right now it feels like the most important thing in the world. "I've seen these matches on television before, so it's something to look forward to. That's why you go abroad to be a coach or a player, you want to be part of the big matches. "It's going to be fun and hopefully there is going to be more." With Rangers trailing Hearts in the Championship, Celtic go into the first meeting between the sides since April 2012 as strong favourites. However, Deila believes Rangers are dangerous opponents and insists there is no chance of complacency from his team. "You need to stay focused," he said. "Before any big match you need to feel right in your head and your heart to give a good performance. "We have big respect for the team we are going to meet. It's going to be a tough game. "Just look back at last weekend; Chelsea, Manchester City, Tottenham [losing in the FA Cup] - the cup is the cup. Everything is possible in football, that's why we love the game." Deila's attempt to scout Rangers in person was scuppered when Hearts' visit to Ibrox was abandoned due to heavy snow and Kenny McDowall's side suffered a second successive postponement last weekend at Cowdenbeath. "If you go through the Rangers players individually, they would be among the three or four best teams in the top division," was Deila's assessment. "As a team they have not performed as well as they would have wanted and there have been things off the pitch which has maybe affected them. "We are meeting a good team but we know that if we are on top of game we are very hard to beat and we should be the best team in Scotland. "It's good that this is a big game, so we won't be underestimating the opponent. "We have to fight with our hearts but we have to have controlled aggression and use our brains - use our quality on the pitch. "The biggest goal we have is to win the treble. If the boys want to be legends that's what they have to do. It's a very difficult task, very few have done it. "We are in a good position, we can win everything and that motivates." 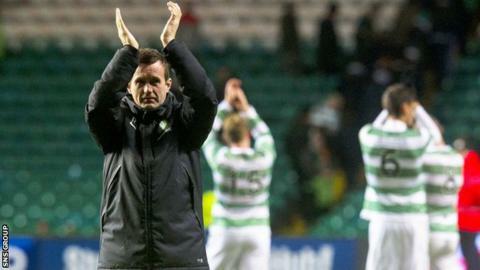 And, in the event of victory, does Deila intend to continue his exuberant post-match ritual of conducting the supporters? "Yes," he said. "You celebrate with your own. I don't see any problems with that. I would never do anything to offend the Rangers fans."